Ethical É - Green Camps! Unique African Camping Adventure?, yes! 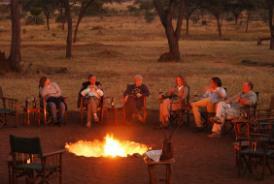 The camping adventure trips that combine the best game viewing in Africa with plenty of cultural interaction. 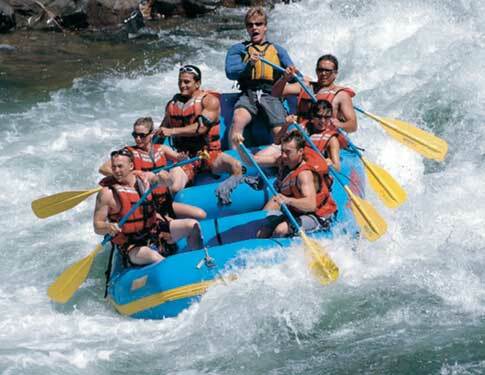 We spend half a lot of the trips in National Parks and Conservation areas searching for breath taking Safaris, unrivaled gorilla and chimpanzee tracking, Bungee jumping and world class white water rafting on the River Nile are all things you'll expect to experience!. We do not disturb the delicate eco-systems of the places we take you to as we camp in designated areas, and rigidly adhere to low impact camping guidelines..
A little local knowledge goes a long way. It turns a good holiday into a truly memorable one. So travelling with us is not just a brief stay somewhere, its a real connection with the people, the landscape, the culture and the environment. Its like really living somewhere and enjoying the peace and quite or the pace and excitement of the place as much as the people who live there do. Due to the large number of travellers and volunteers travelling with us at any one time, we are able to arrange these excursions at a fraction of the price charged by commercial tour companies. We take you there for less!!!! Experience the great gorillas of Bwindi, the apes of Kibale Forest and Africa's amazing Lake Bunyonyi! Meet the gorillas from Bwindi and enjoy canoe trekking in Bunyonyi plus spend a day exploring Kabale the Switzerland of Africa! 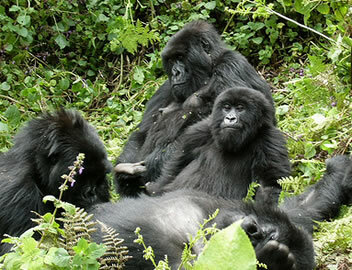 Experience the world's largest Gorilla home Bwindi Impenetrable forest and enjoy the hike towards their families. A memorable experience! We tailor make camping trips every weekend to these forest reserves and trips cost from EUR €50 to EUR €250, contact us if you want to join us or inquire on where are we going the next weekend! NOTE: Our volunteer specialist will forward your infos to our adventure specialist who will work on your itinerary and send back confirmation within 48hrs of your booking. Can't wait to share the amazing safari moments with you! How we makes a difference? During our tours we include visiting our local supported projects depending on which direction we are heading to beginning. The profits made from the fees you pay go towards helping support our locally run projects, the goal of the tours is to promote responsible tourism for all. We are raising funds for the construction of purpose-built primary schools and employment of local teachers in Africa as well as initiating health care initiatives along. Don't be surprised if the highlight of your trip isn't a lion in the wild, but time spent with the locals or our local communities- be warned it’ a powerful experience. Your Helping goes a long way! Our trips are focused on respecting and benefiting the local people and the environment of this country. On while on trip you will be lead by an experienced local leader passionate about their country's history, heritage and natural beauty that will help you to get 'under the skin' of their country and see it through the eyes of a local. The trips stays are at locally run accommodation and ensures we eat at local restaurants. Responsible tourism? We are with you! We are constantly seeking new and innovative ways of neutralising our impact on the environment. Consequently we offset the land component of all our tours carbon emissions. We think that since it’s our tours that created the emissions then it’s our responsibility to do something about them; we don’t think it’s fair to simply transfer our responsibility to you. All of our tours are designed to provide funds for local community projects and initiatives that promote responsible and sustainable tourism development in Africa where we operate. First and foremost, but not exclusively, the enterprise supports projects and initiatives that advance education and employment within the tourism and hospitality industry. The Enterprise operates on a not-for-profit basis, with every cent of funds donated by us, our staff and our travellers, going to the visited projects. Experience the Uganda's Big-5 game drives, the water falls, the rhinos and Zebras found in the Lake Mburo Park. 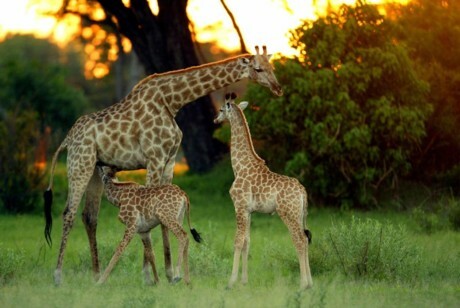 A short amazing safari into the Uganda's wildlife! Experience the Big-5 game drive in Murchison falls, the water falls and the rhinos found in the Zziwa Rhino Sanctuary. Experience the wonders of Murchison Falls and its magnificent wildlife! Experience the tree climbing lions of Queen Elizabeth and a cruise on the Kazinga Channel. Experience all that eastern Uganda has to offer from rafting the Nile, walking through sipifalls to hiking Mt. Elgon. Trek on the Uganda's popular Mt. Rwenzori, your chance to see and enjoy this amazing mountain based in the South Western Uganda. Day 3: Trekk 6.9 kilometres 4 to 5 hours. Climbing to 3,515 metres to Kalalama. Explore the best top fresh waters of Uganda from the South to the eastern part of the country. Explore the 7-falls called Sipi in the eastern plus a trek in Mt. Elgon park to view the top of the mountains and its surroundings.